Johannesburg Executive Mayor Cllr Mpho Parks Tau unveiled a R1.95 billion (US$173.85 million) mixed residential development in South Hills, southern Johannesburg, in a move aimed at reversing apartheid’s spatial planning and integrating communities. “People who used to say the South is long dead and buried had better wait and see. The old South is rising and it’s going to be a jewel in the City of Johannesburg’s crown,” Executive Mayor Mpho Parks Tau said at the launch of the R1.95 billion South Hills mixed housing development yesterday. 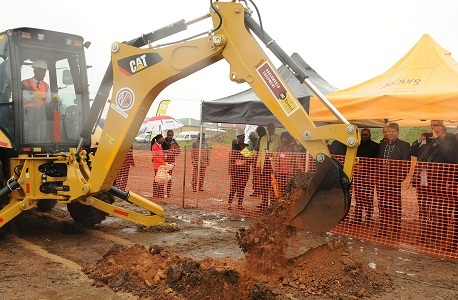 The Executive Mayor was addressing hundreds of residents, members of the business community and City officials at Moffat View Extension 4, south of the Johannesburg CBD, who had gathered to witness the birth of one of the biggest housing developments the City has undertaken. “This area forms part of the City’s Corridors of Freedom and it’s earmarked for development to reverse apartheid’s spatial planning and to help turn Johannesburg into an inclusive city, with access to safer, more reliable and affordable forms of transport such as the Rea Vaya bus rapid transit (BRT) system and free Wi-Fi hotspots,” he said. The housing development, which is about 6km from the Johannesburg city centre, is a partnership between the City, Standard Bank, property developers Calgro M3 and residents. The development is aimed at reducing the housing backlog in the inner city and surrounding areas. Mayor Tau said the 5 327-unit housing development would contribute to the City’s objective of stitching Johannesburg by cutting across various classes and bringing together communities in a prime area closer to economic opportunities and transport nodes. He said providing housing for the poor and middle-to-high-income groups was a deliberate move by the City to foster social cohesion. The Executive Mayor also disclosed that 50 stands had been set aside for sale to residents who wanted to build their own homes. “Not all people qualify for bonds or housing subsidies. That’s why some of our people lost their life’s savings paying unscrupulous landlords who had illegally portioned off council-owned land. It was heart-breaking to watch bulldozers tear down people’s houses,” he said. Mayor Tau said as a result of the massive infrastructure development planned for the area – Rosettenville and Turffontein – property ownership was set to boom. The project is expected to be completed within six years and the City will invest R750 million in the form of grants and subsidies.